Commonopoly asks: What if the goal of the game wasn’t to crush other players under the boot heel of capitalist greed? 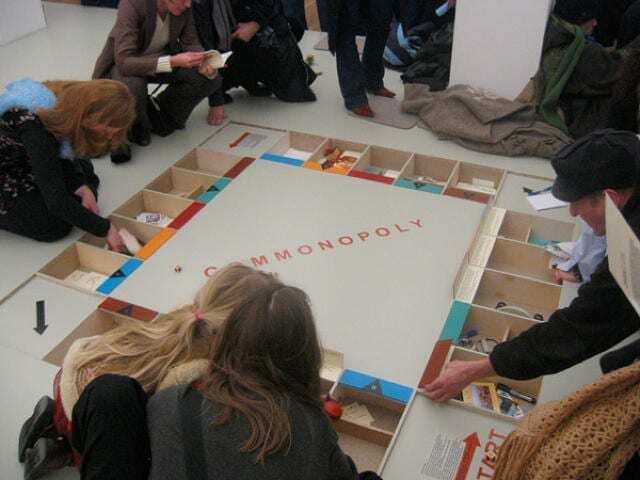 A now-defunct German art collective that went by the name of Big Hope has revolutionized the Monopoly board, making the goals less about accruing wealth and more about collective benefit, and called it “Commonopoly.” The new game, designed by Miklos Erhardt, Dominic Hislop, and Elske Rosenfeld in 2004, arranges things so that no one player is the banker, and they all have to collaborate on their moves. “Unlike Monopoly, the goal of Commonopoly is not the exhaustion, through monopolization, of a virtual stock of goods, but rather the expansion and preservation of a self-propelling sustainable system of recycling, production and distribution,” the creators write. Commonopoly, which has recently resurfaced in a couple of places online, demands that players brainstorm alternative economic systems through activities placed around the board. The players move counter clockwise, as per the instructions, and subsequent creative acts are to be documented in booklets later distributed to the public. Much of the game focuses on coming up with ideas for public spaces (in Taipei or elsewhere), as well as sharing home remedies for common ailments. You have to applaud the game’s Marxist kitsch, and maybe even the prescient, proto-Zuccotti Park flair.